Toddlers deserve teardowns too! Ok, maybe teardowns are still for grownups, but let's do something for those little ones that haven't learned to read xml yet. 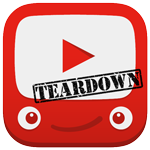 The YouTube Kids app has only been available since late February, so it's fair to expect a lot of changes and new features in each release. Last week's update brought immersive mode and better voice search, but a look inside revealed that there are some extra toys in the future.